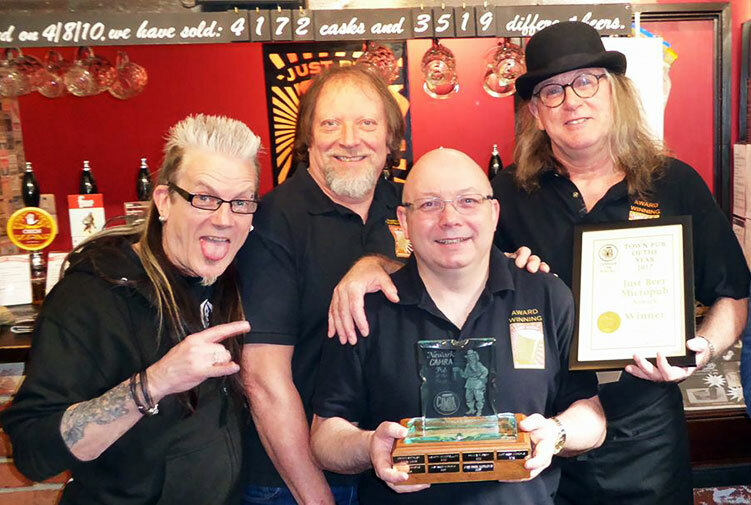 Just Beer has again received the accolade of Newark CAMRA Pub of the Year 2017 making it Newark’s top pub for the fifth time in six years. The trophy was presented yesterday (Sunday 5th March) by Newark CAMRA Chairman Andrew Birkhead and Rob Neil, POTY co-ordinater. The pub business can be tough going at times, but days like this make it all worthwhile. We thank Newark CAMRA for the recognition and of course all of our customers for making it possible. Without you there would be no Just Beer! JB will continue to bring you tasty and exciting beers from breweries both old and new (especially new!) in the future and hope to see you all soon. Look out for our next beer festival which runs May 22nd – 25th, complementing the annual Newark CAMRA beer festival.